Some time ago, I had read that in Rajasthan, on the way from Jaipur to Alwar, there exist the ruins of an erstwhile royal city called Bhangarh, which was completely abandoned in the XVII century for mysterious reasons. It is certainly not something new if you have heard about Fatehpur Sikri, the fascinating ghost town near Agra built by the former Mughal Emperor Akbar. But the reputation of Bhangarh is different because there is a belief that the place is haunted and no one dares to go there after sunset! 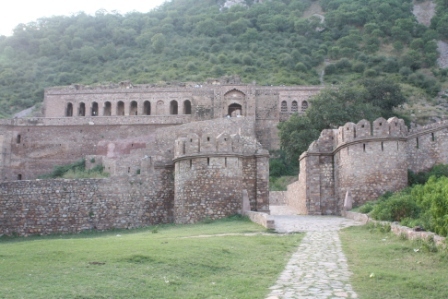 The Bhangarh Fort is even mentioned amongst the world’s most haunted places alongside the world famous Scottish castles. A signboard at the entrance written in Hindi warns ‘’Entering the borders of Bhangarh before sunrise and after sunset is strictly prohibited’’. It is really bizarre for something like this to be present in India, a country of a million gods and temples. I never thought there would be space for ghosts! The local residents, mostly farmers and shepherds living two or three kms away, are scared to venture into the place at night because of ‘strange presences’ and ‘noises’ inside the ruins, especially in the ‘Haveli of the Dancers’. I visited the fort at midday and it looked to me as a calm and relaxing place. What remains is a shadow of a once beautiful kingdom. The area is under the patronage of the Archaeological Survey of India (ASI) and the entrance is free. You only need to pay for parking. 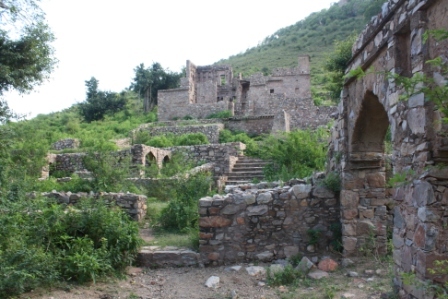 Given its sinister reputation, Bhangarh has become a tourist attraction, especially for youngsters who come here from Gurgaon or Delhi to experience the thrill of seeing the ‘ghosts’. The town was fortified with five gates, but today only the main gate at the entrance remains. At the beginning of a path you will find a map of the city that depicts that it was well planned and very rich considering the number of temples, huge havelis and the impressive royal palace dominating the top with the hills on the back. 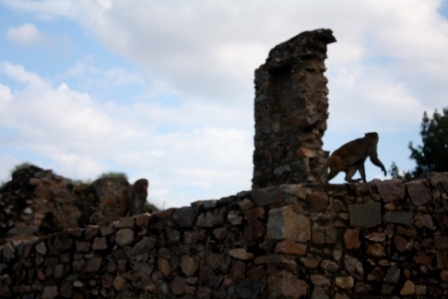 The ruins are now surrounded by thick vegetation due to the heavy monsoon rains of this year. The city was founded in 1613 (or at the end of 1500 according to other sources) by the father of Maharaja Madho Singh, brother of a general of the emperor Akbar. Apparently, about 10 thousand families lived here. Walking around, you can see the remnants of the bazaar, several houses and havelis, temples and the big palace at the summit. 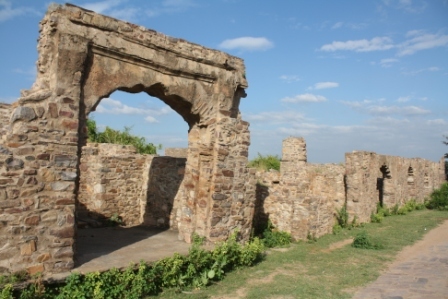 It seems that with the decline of the Mughal, Bhangarh also weakened. It was conquered in 1720 by the Maharaja of Jaipur and a century later, probably because of a big famine, was abandoned. Since then, it has remained deserted. There are two legends regarding the ‘ghosts’. The first is connected to a curse from the local ‘’sadhu’’, Guru Balu Nath, who lived in a cave and was ‘’disturbed’’ by the construction of the new city. The guru said that if the shadow of the enormous palace hits his cave, a disaster would come and all the inhabitants will die. He is buried nearby. The other legend is about a beautiful princess, Ratnavati, and a sorcerer who had fallen in love with her. Not being able to marry the girl, he cursed the entire city making Bhangarh collapse after a short while.